Bell Canyon is a short ravine that joins Little Wild Horse Canyon; it is just 1.5 miles long and is narrow, albeit rather shallow, for most of its length, and has a great variety of rock forms, textures and colors, unlike most slot canyons that pass through a single homogenous layer. 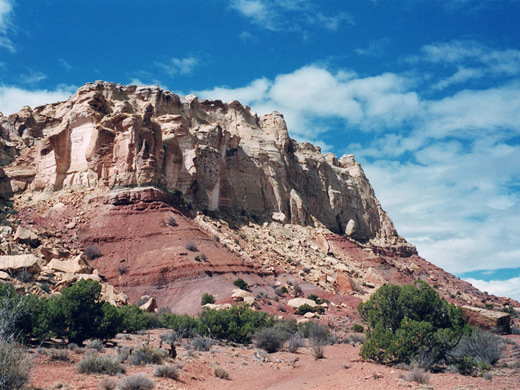 Both canyons cut through the Kayenta, Wingate and Navajo sandstone strata, the main components of the San Rafael Reef. They may be visited all year, although winter brings snowfall and icy pools, while the temperatures in mid summer may exceed 100 °F, so spring and fall are the favored seasons. 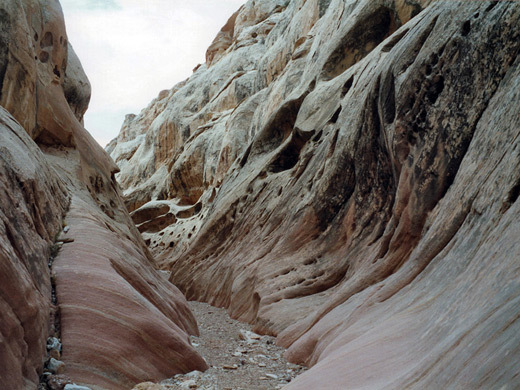 See Little Wild Horse Canyon. 6 views of Bell Canyon. TopoQuest topographic map of Bell Canyon. Walking upstream along Little Wild Horse Canyon north from the trailhead, the Bell Canyon junction is reached after ten minutes, past some short narrows and a minor dryfall - it is a side ravine that veers away to the left. From the start the canyon is very rocky and boulder strewn, the streambed covered by sand and pebbles of various colors and sizes. The walls are made up of exposed, angled strata, and all the surroundings show signs of great erosion. The canyon narrows quite soon but remains fairly open, without any obstructions apart from several dryfalls a few feet high. The passage twists and turns, and the enclosing rocks rise far above, becoming several hundred feet high though not sheer, as even at its deepest point the canyon is V-shaped in profile. The narrows finish after 30 minutes walking, when the passageway opens out a lot, and a wide gravelly wash winds through the canyon, which now is bordered by sand banks and boulder piles at each side. After 15 minutes more, a faint track (the disused far end of Chute Canyon Road) crosses the streambed - this is quite easy to miss, but necessary since along here is the way in to the upper end of Little Wild Horse Canyon and the continuation of the loop hike. The road follows beneath the cliffs that run towards the northeast, rounds a promontory then turns back southeast. The surrounding landscape has seemingly endless layered, eroded rocks of every color - mainly shades of green, grey, purple, green and white.